The Tour de Yorkshire otherwise known as Le Bloody Tour by my partner. L and I are doing the sportive on day three just hours ahead on the professional race. 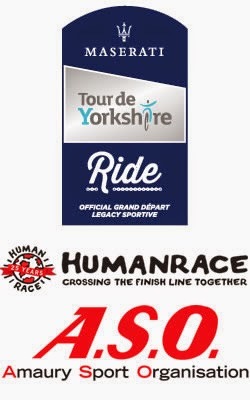 Stage three actually race runs from Wakefield to Leeds but our sportive is Leeds to Leeds. Otherwise they’d have to bus everyone to either the start or the finish. The whole thing is inspired by the Grand Départ of the Tour de France that of course was in Yorkshire last year. Today we face the same hills and are supported by almost the same sized crowds, who even come out in numbers for the sportive riders. That’s even more impressive when you realise that we awoke to heavy rain pounding on the house roof morning followed by heavy rain pounding the car as we drove up the M1. I have been allocated a 9:46 start time for the medium distance 108km route and a plea to be there an hour before, which due to traffic we fail miserably on. L has a slightly later start time as she is doing the short distance 55km route or the Cycletta that isn't. The standard short distance 55km starts at the same time and runs over the same course, so the ‘Cycletta’ can hardly be described as women only. Now to decide how far to go with the waterproofs. The forecast says it’s probably going to rain for most of the day. I was one of the last to start and the course is a brute, which may make reaching the cut off time at Ilkey interesting. So full kudos to the professional who are doing this a lot faster than we are. After about an hour the rain eases and eventually stops, I wasn’t expecting that. I roll into the first feed station at Cullingworth having done 49km. The feed is disappointing, serving just cold potatoes, a few digestives and some sweets plus sports drink. Good job I have some bars and gels with me as there’s not much to top up your energy levels there. A short stop, then off again. The route is nice, jaw droppingly beautiful and the roads are in decent condition. I know they resurfaced many for last year’s race. Then there’s the girls in bikinis braving the weather, stood at the side of the road and waving flags. Then there are the hallucinations brought on by the cold and the lack of food at the feed station. I hope L’s warmed up on her ride. I text her, although her phone keeps going flat and is unlikely to last the day. I get a reply, all seems good. The terrain, which was tough, suddenly gets tougher. There’s the cobbled climb near Haworth, which was definitely a highlight and then there was Goose Eye, which was astonishingly steep. Then there are the rivers of blood down some of the descents. That’s not a pretty sight. On one particular stretch we have to ride around four ambulances and in the end were told to get off and walk. Such steep descents and wet roads are not a happy combination. I head through Silsden and Addingham where we watched the Tour de France from last year. We pass the pub we watched from where once again a crowd has gathered and they cheer us through. The second feed station is on the Ilkley Road at 70km and this is the vital cut off point. If you don’t get here with room to spare before the pro-race you’re going to have to park up for a while. My group makes it with 20 minutes to spare. Enough time to tuck in to the trays of mini Yorkshire pudding filled with sausages and onion gravy. There are also freshly baked flapjacks. This feed station is as awesome as the first one was awful. L say her feed station was rubbish too and she didn’t get to go to this one. After about five of each, I pedal off and head up the Cow and Calf climb. The final big climb is the Chevin and it was just after this that my bike decided it had had enough. I’d been experiencing a bit of gear slip with the bike jumping out of lowest gear last week and I’d adjusted things so now it was much better but not quite perfect. Occasionally I had to hold it in gear. I’m not sure if this was a factor of not, when my chain snapped with 11km to go. L has already finished in 3:32. I could be a lot longer. According to the official timings I had crested the Chevin in 4:46, personally I’d take about 30 minutes off that for my two stops. I look around for a service bike, they were everywhere earlier. In the end I dial the emergency rescue number. Please send Thunderbirds 1 and 2. What do you mean they’re busy? Instead I book a place on the broom wagon. How embarrassing, although L will be dead jealous. Unfortunately they tell me that they can’t get to me because the main race is imminent. They tell me it could be hours, so I watch the pro-race go through and then start walking. L meanwhile tries to find me but it’s not easy and she returns to the car park. I get rescued quicker than expected, although the chap who picks me then gets lost but we get to the car park eventually. Where L is waiting. It's been an inglorious end but it's still the best event I've ever done. We had hoped to pop in to see someone on the way back in Wakefield but that’s now gone by the wayside as I’m so late. Instead its home to the dogs who will most definitely be tapping their paws in annoyance. It’s even too late to go out, so we order in a curry instead.